Birding during quiet periods can sometimes feel like you’re trying to make something out of nothing. Persevere and take heart in the knowledge that there is always something. All we have to do is find it. King Eiders appear sporadically in the Rochester area during the winter months, but, so far this season, I’ve been striking out on seeing one. Can’t say that anymore after spying an immature male hanging with the rest of the winter waterfowl at Irondequoit Bay. 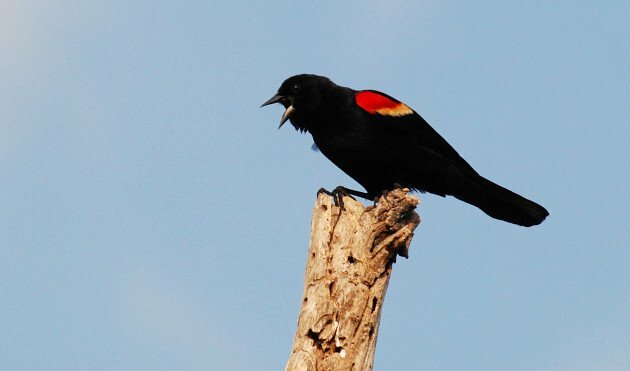 Corey’s Best Bird of the Weekend was actually a large flock of birds, a horde of Red-winged Blackbirds, his first large flock of them since fall. It’s nice to see a sign of spring in early February! After a very birdy 150 plus species day in Carara National Park and a day of birding around birdy Arenal, it’s hard to pick the best. Cape May Warber is rare in Costa Rica so that should take my weekend prize but since I had already seen it earlier that week, I’ll go with a Barred Hawk that gave excellent, right over the head views.